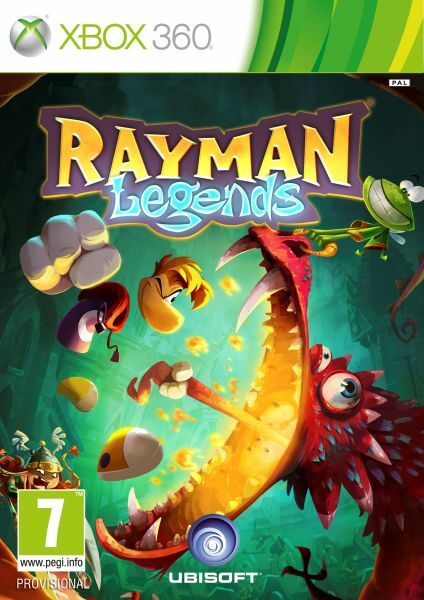 Rayman, everyone's favourite limbless hero, has returned for another adventure! 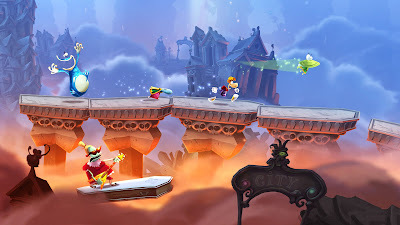 After the events of Origins, Rayman and his buddies slept for a hundred years, and awoke to a disaster; the nightmares and five evil teensies had grown in power and kidnapped the ten princesses. So that's where you come in! You must progress through the levels, killing anything evil, collecting lums and rescuing teensies. Much like in the first Rayman game and Origins, it's a 2D side-scroller, and anyone who has played the 3D titles in the series knows that this can only be a good thing. On the surface, it looks like it could be the best Rayman outing yet, but does it live up to that? Read on to find out. The game starts off simply enough, you just have to run, jump and punch through simple, classic platforming levels. Soon, you'll be wall-jumping, ground-pounding and gliding your way through gauntlets, where a wrong move means certain death, and a gruelling trek from wherever the last checkpoint may have been. Don't let the beautiful graphics fool you, this is not really an easy game to play. It may look suitable for kids, but they won't get very far at all. You need nerves of steel and a lot of patience, particularly for some of the later chapters. And that's before you try the Invasion levels. These are short, timed levels. Beat the level before forty seconds and you'll save all three teensies, after which one dies every ten seconds. It's so incredibly frustrating, repeatedly finishing the level a couple of seconds too late, but it's damn satisfying when you eventually manage it. At the end of each chapter, you'll have access to a musical level. It's very similar to the Bit.Trip Runner games; platforming levels which coincide with music, giving the illusion that your actions are controlling the music. And each of these levels is a little tiny masterpiece. You'll hear remixes of classic songs, remade in the weird and wonderful Rayman universe. Don't miss these! Four players can play altogether, and never has the saying "the more, the merrier" been more apt. Playing with three of your friends makes for a whole lot of hectic, fast-paced fun. It's hard enough to keep track when you're playing solo, so trying to see which character is yours amongst a rabble of four is just madness. If all of the new levels from Legends aren't enough, there are forty levels from Origins, with updated graphics and gameplay from Legends. It's great for people who didn't pick up Origins, and adds a lot of extra gameplay time onto the game. There's also a really fun mode called Kung Foot, which is just a football mini-game. Two teams of two players can face off, and it's just a crazy race to smash the ball into the other team's goal. It's more insanity for a game already jam-packed with it. Unfortunately, you cannot play multiplayer online, which seems rather odd when the local multiplayer is so fun, and every other game seems to have some form of online mode. As well as all of the modes mentioned above (as if there wasn't enough), there are many other things to do. There are daily and weekly challenges, in which you take part in a fast-paced mini-game such as collecting a certain amount of lums or reaching a specific height in a tower climb, and you receive a trophy at the end. Boot up the game the next day and you'll get your reward, and a new challenge. The weekly challenges are basically the same but only change every week, obviously. If you reach a certain level of awesomeness (your awesome level increases as earn more trophies), you unlock the extreme daily and weekly challenges, which are just harder challenges. It's something to keep you coming back to the game often, which is never a bad thing. If you get enough lums on a level, you are awarded with a scratch card, which can either give you a teensy, lums, more Rayman Origins levels and creatures. The creatures are sort of like collectables, and come in a variety of different types, such as robots, balloons and funnily enough, toast. Each creature gives you a set amount of lums each day, which is just another reason to play more. There's a boss at the end of each chapter, and they get damn hard! 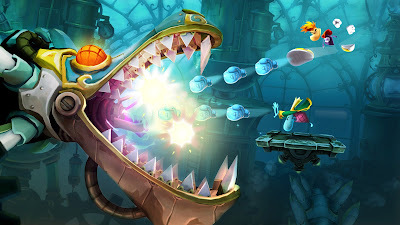 Rayman Legends is a beautiful, difficult but most importantly ridiculously fun game. There are so many levels, and beyond that a bucket-load of extras to keep you coming back for more of Rayman and friends. The challenges are a great way to compete with other players, which brings us to the only negative aspect of the game. No online play! It's unforgivable in this day and age, especially when the local multiplayer modes are so damn impressive. Still, this game has more content than most other games that come out these days, and the inclusion of a huge selection of levels from the previous titles means that you're basically getting two games for the price of one. Don't miss this, you'll regret it!